Lizard Hill Hosting Review 2019: Is Lizard Hill Hosting a Good Hosting? Lizard Hill Hosting claims to provide superior web hosting at the best possible prices, but the reality is that its plans are slightly overpriced for the features and resources on offer. Las Vegas hosting vendor Lizard Hill Hosting was founded in 1992 by Western Horizon Technologies (WHT) with the aim of providing superior web hosting at the best possible prices. This vendor specializes in shared web hosting, which it delivers from data centers on the West Coast of the U.S.A. Although you can view the Lizard Hill website in 26 different languages, these are automated translations of the English-language content. Lizard Hill Hosting offers five shared web hosting plans, starting with the Personal plan (for individual users) and progressing up to the Unlimited plan (for big businesses). Lizard Hill offers simple web hosting with no premium features such as DDoS protection or shared hosting isolation with CloudLinux. There’s no website builder, but each account comes with more than 50 applications already installed, and customers can install additional applications using the Installatron one-click installer within the DirectAdmin control panel. These additional applications include WordPress, Magento, PrestaShop, Joomla, and accounting software. 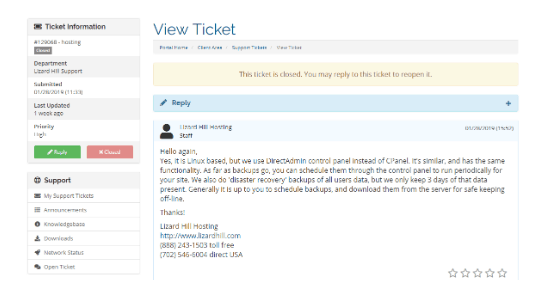 As is typical for web hosts, Lizard Hill does disaster recovery backups, but it’s up to you to schedule your own backups (e.g., using Cron) and download them for recovery purposes. Except for the base plan, the hosting plans are differentiated by the storage space provided. The ‘Personal’ plan is reasonably priced, but all the other plans are overpriced for the resources you get. For example, the 20,000 MB ‘Gila’ plan is priced higher than the industry norm. One good thing is that you get a free SSL certificate. And if you’re willing to commit to a three-year term, you can secure a discount of up to to 50%. There is no free trial to mitigate your commitment risk, but there is a 30-day money-back guarantee that should get you out if it all goes wrong within the first month. Lizard Hill’s customer contact options include toll-free telephone numbers, online tickets, a contact form, email, phone, fax, and support pager. The final two technologies might make you wonder if this company died in the 1990s, but I can confirm that Lizard Hill is still very much alive and well. When I submitted a ticket, an agent responded in about three hours and was keen to address my concerns. If you prefer to support yourself, Google search might be your only option because there is no information in the knowledge base beyond how to log into your account. If you’re looking for a US-based provider of straightforward hosting packages, Lizard Hill Hosting might be one for your list. But if you want better security and premium tools, you’ll probably have to look elsewhere. Wondering how Lizard Hill Hosting stacks up against other Web Hosting companies? Enter any other Web Hosting company and we will give you a side-by-side comparison.